Banking and financial services stocks have been key drivers of the current rally that has led benchmark indices to fresh six-month highs. The up move has been fuelled by hopes of Modi’s return at the Centre and renewed FII inflow. Bank Nifty has rallied 10 percent in March so far and financial services index has climbed around 8 percent in comparison to Nifty’s over 5 percent gain. Index constituents Punjab National Bank, Bank Of Baroda, IndusInd Bank, IDFC First Bank, ICICI Bank, RBL Bank and SBI have rallied 10-20 percent during the current month. Meanwhile, Kotak Mahindra Bank, Federal Bank, HDFC Bank, Yes Bank and Axis Bank have gained 5-9 percent. related news Technical View: Nifty forms bullish candle on weekly charts, next target seen at 11,500 Siamese Twins: Can the cross-listing of foreign companies work in India? In Focus with Udayan Mukherjee | SIP inflows ebb; what should investors do? 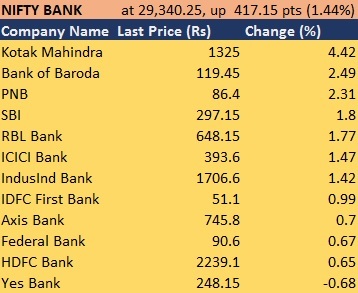 Today, Bank Nifty gained more than a percent to hit a record high of 29,488 intraday, driven by Kotak Mahindra Bank (up 4.4 percent), Bank of Baroda (up 2.5 percent), PNB (2.3 percent), SBI (1.8 percent) and ICICI Bank (1.5 percent). Nifty Financial Service index also climbed over a percent. Another reason which could be supporting growth in Bank Nifty is credit growth. Systemic credit growth has recovered to a five-year-high of around 14 percent, while deposit growth remains modest at 10 percent. Motilal Oswal expects credit growth to remain strong, given the improving economic parameters and rising share of banks in the total credit needs of the economy. “Key beneficiaries of this trend will be lenders with strong liability franchisee, as it will allow smooth flow of funds at reasonable costs,” it said. On analysing key trends, the brokerage noted that private banks’ share in total deposits has increased to 27 percent from 18.6 percent in FY14, and CASA market share of private banks has increased from 21.7 percent in FY14 to 28.8 percent, while the share of banks offering differential savings account rates has increased to 5 percent from 1.4 percent in FY14. Jan Dhan deposits formed 9 percent of incremental SA deposits for PSU banks, it said. Reserve Bank of India (RBI) has issued 12 banking licences (including SFBs) over the past five years, as against 12 licenses in the preceding 20 years. “This has allowed conversion of many non-bank lenders into banks and enabled them access to stable and low-cost liabilities. Recent funding issues in the financial sector have again stressed the need of the liability franchisee. This consideration will drive M&As, going forward. The RBI, too, will step in support of such moves,” Motilal Oswal said. On March 13, the Reserve Bank of India had said it would inject long-term liquidity worth $5 billion into the system through foreign exchange swap arrangement with banks for three years, to meet the durable liquidity needs of the system. Overall, analysts remain positive on banking space as they expect asset quality to improve further in FY20 which may help them to report strong earnings. “Over the past four-five years, focus of Indian financial system has largely been on handling corporate stress and increasing lending to retail. However, we now believe this is poised to reverse,” Edelweiss said. In quarter ended December 2018, asset quality of corporate banks improved in Q3FY19. In fact, larger corporate banks posted good numbers on the corporate slippage front. This entry was posted in Stocks on March 21, 2019 by admin.